How in the heck does one get into art directing?? I fell into the art direction/production world completely unintentionally. One of my best friends, Marshall Burnette, and I were living together in the mountains of east Tennessee a little over five years ago. Marshall had just graduated from Vancouver Film School and I had just finished my masters in illustration from ETSU. Marshall had a directing job outside of Nashville and needed someone to help with art, and since my life has been art for as long as I can remember, I agreed (although I knew nothing about the job). Soon after that, we moved to Nashville and I started working as an art director and I haven't looked back. Of all the work you've done thus far, what is something you're most proud of? It's hard to say what project I'm most proud of. I guess it would have to be the music video for "Break Hearts" by the bank How I Became the Bomb. It was directed by David Shaman. The video still hasn't been released, but it was extremely art heavy and quite a puzzle to figure out. I had to man a set of floating light orbs that were supposed to be "conscious" as well as bring a model UFO to life. That was one of the more challenging jobs I've had thus far. I really like a good challenge. They seem to really push me and improve my skill set. Chris dressing set on our music video for Michael Ray, "Real Men Love Jesus." You're a man of many talents. Let's pretend you've had a crazy stressful day and you need a creative outlet to unleash upon. What medium do you turn to? Hahahahaha, thanks for the compliment, guys! When I'm having a bad day, I usually crack a beer and binge watch Parks and Recreation. I prefer to draw or paint when I get a chance. Illustration and painting are my first artistic loves. I also work on my personal/gallery work when production/film jobs are slow. I can really zone out on my personal work and kind of slip away into the world of my subjects I paint. I like going deep into human antiquity where the aliens are showing people how to build structures and be civilized. A potential client calls and says, "Chris, you're amazing. We want to hire you and I think this is your dream project." What's that dream project? My dream project. Hmmmm. Well, I would say there are two, one for each medium. The first being the production designer on a sci-fi feature. Maybe something along the lines of Star Gate, but better acting. The second, being able to paint murals of demi god creatures on a massive scale (i.e. really big walls where everyone that may not got to galleries can see it). If you've driven on Gallatin Rd. 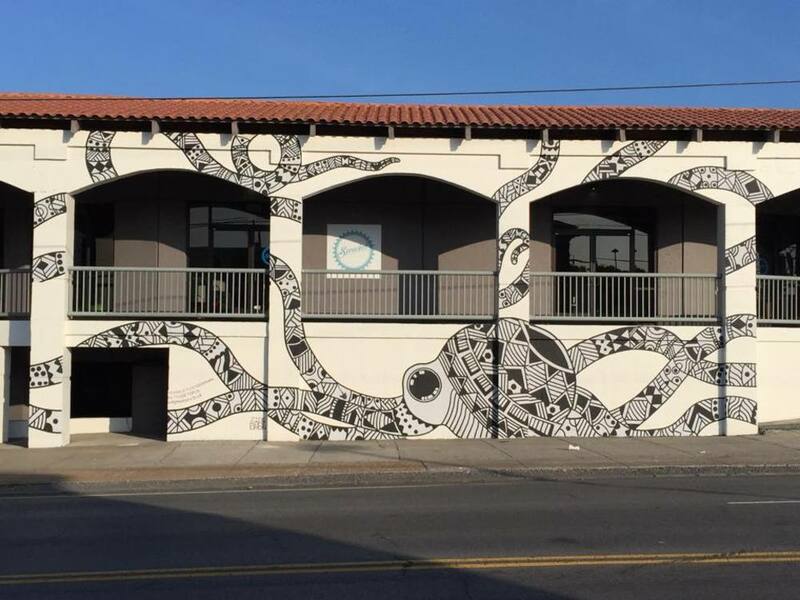 in East Nashville, you've definitely noticed the eye catching work he did for Little Octopus. You've worked with Inkwell a few times now, is there something you feel is enjoyable about our sets? Something that draws you to the team? Or even a favorite moment? I have thoroughly enjoyed working with you fellas and ladies at Inkwell! I like that you guys care about art in film. I feel like most directors and producers slice off the art budget first thing with a lot of films projects, ya know? It's kind of boring without anything actually on those walls. You fells are a lot of fun to work with, very laid back and trusting of your crew, and that's very much appreciated on my part. I hope we can work on many more projects in the future! Thanks so much for the opportunity to answer some questions!